I was stuck in the wrong profession for a long time, progressively dying on the inside, at odds with who I was. My internal house was not in order. After giving birth to my first son a decade ago, I left career in architecture to search for my personal true north and began a yoga practice. It was like coming home. Just as we train our physical body for optimal health and performance, we must also train our mind to access our greatest potential. This is my connection to Yoga. I am a meditation devotee and incorporate it into every class. 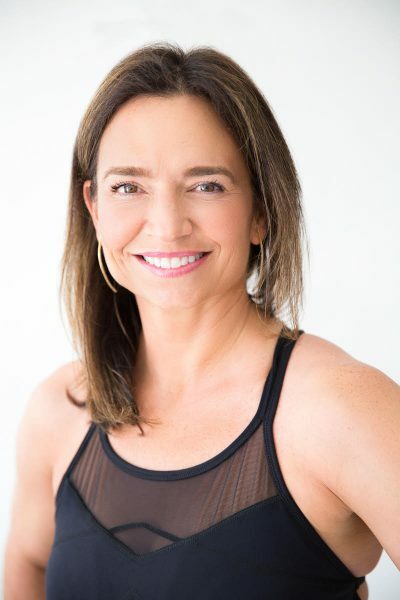 I teach a sweaty Vinyasa flow with a soulful playlist that is rooted in making a mindful connection between body and breath. I hope to inspire you to meet your edge, with an emphasis on healthy alignment to create a safe but challenging practice. I believe Yoga is beyond a series of poses for the physical body. It’s also how we connect to our inner landscape. Instead of trying to control the outside world, this practice empowers us to manage our perceptions from the inside. For me it’s also about eating clean food, cultivating joy, being fearless and having compassion for others and our environment. After being raised in Western Canada, I now reside in New Canaan, CT with my husband and two boys. When I’m not on my mat, I love a good physical challenge, snowboarding, diving and taking my Yoga practice on a paddle board. I am deeply thankful to the following people for their inspiration, spiritual guidance and encouragement: Seane Corn, Raghunath, Tara Brach, Jack Kornfield, Pema Chödrön, Sharon Salzberg, Casey McBride, Basil Jones and Donna Jackson.